I’m going to confess something. Before I was frugal, I used to toss my vinyl shower curtain liners when they got yucky with soap scum and mildew. Even if I spent top dollar on a mildew-resistant, PEVA, non-toxic shower curtain, I still tossed it when it got gross. I’m happy to say I’ve changed my ways and saved some cash! It turns out it’s really easy to clean a vinyl shower curtain liner. 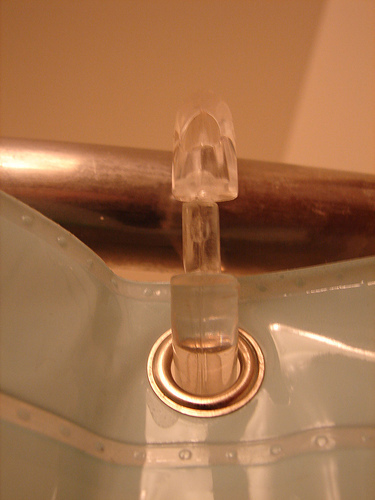 Simply remove the shower curtain liner from the shower rod and take off the shower curtain rings. Toss the vinyl shower curtain in the washing machine with an old towel. Fill the fabric softener dispenser with a cup of white vinegar. Add a tiny amount of laundry detergent to the soap dispenser. Hang the clean shower curtain liner to dry. Voila! Clean shower curtain liner! I’ve found you can get numerous washings out of a single vinyl shower curtain. When it’s time to retire the shower curtain liner, save it to use as a drop cloth for painting and craft projects. Got a cheap trick of your own? Send us an e-mail with your tip and we may use it in a future Cheap Trick post! When I was a college student I cleaned hotel rooms. The hotel I worked at never used vinyl liners. Each tub had a single polyester shower curtain instead; just tuck the curtain inside the tub before turning on the shower. The curtains are machine washable and I know the white curtains can be bleached. After a while (years), when the hem starts to look unsightly, I have it shortened a bit. I have my own home now and use a poly curtain as a liner and keep a decorative curtain outside of the tub. I prefer the polyester curtains not only because they last for many years, but they aren’t stiff and they don’t have that strong vinyl smell. Another reader had e-mailed me the same thing… Had not thought to use a polyester shower curtain before – but it is a great idea and much more environmentally friendly than vinyl. I do exactly the same except I throw it in the dryer on ‘air only’ with a couple of dry beach towels….works great. If the liner is sturdy enough it lasts for yrs. Also I hadn’t been using vinegar (bleach instead) makes sense though. I prefer the vinyl because I absolutely hate when the fabric liners get so wet and make the decorative ones wet…bleh! Never thought to put it on air dry in the dryer! Usually I just hang it back up in the shower or out on the clothesline in the summer. I sent this via an email but then I saw I could add it here at the bottom. When my vinyl shower curtain is beyond saving (after many washings), I cut the magnets out at the bottom. They make great refrigerator magnets!! That’s a great idea, Cate! You could also use the liner as a drop cloth for painting or other projects. We use the fabric liner and wash it a few times a month. We have had it for ages and I feel like it should have saved money by now and it is still going :) I highly recommend it when your other one stops working.